GigaMux 3200 provides access to individual DWDM channels within fibre connections. GigaMux 3200 is an Active DWDM device – meaning that it takes care of the application of individual wavelengths or ‘colours’ to the incoming signal from client equipment such as Routers, Servers, Legacy equipment etc. It also provides features such as Wavelength demarcation and performance monitoring, Sub-wavelength multiplexing (several channels within an individual wavelength and advanced optical networking features such as long distance connections using Optical Amplifiers and local channel add and drop using Flexible OADM capabilities. It is also ableto support Layer 1 encryption. GigaMux 3200 comes in several chassis depending on the application – 1U, 2U and 6U and can be configured in many different ways depending on the requirement. In standard form GigaMux 3200 and provide up to 40 different coloured wavelengths that can be used either to carry different service types to or to increase the capacity of the fibre. In the configuration above GigaMux 3200 can terminate 10 * 10Gb/s wavelength connections. As well as simple point to point connections GigaMux 3200 can also build complex networks such as rings and meshes on the same fibre using OADM technology that avoids the need for electronics at intermediate locations which improves space and power utilisation while improving performance parameters such as Latency. The use of wavelength routing in this manner creates direct connection between non adjacent nodes as if they were individual fibre connections. At Sorrento we use the term Virtual Fibre to describe this. 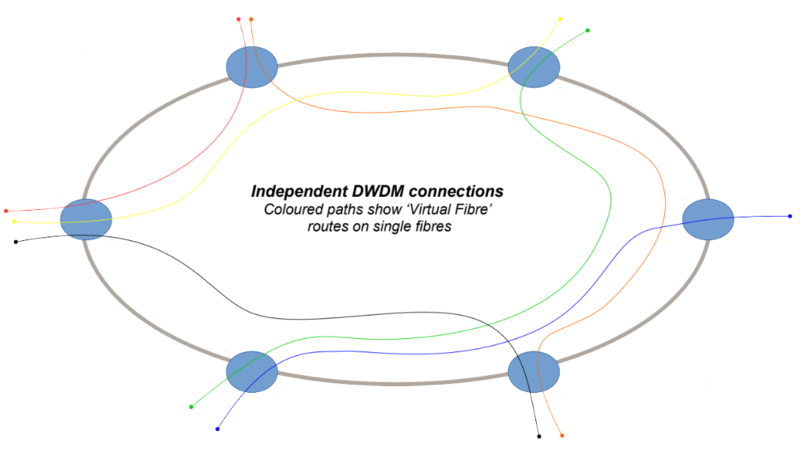 Each of the coloured lines on the diagram shows a wavelength connection across a ring network that otherwise has no electronic devices in it. Each wavelength has a capacity that could be a low as 100Mb/s or as high as 100Gb/s with any protocol low latency and with Encryption options.